A gene that is inserted directly into a cell usually does not function. Instead, a carrier called a vector is genetically engineered to deliver the gene. Certain viruses are often used as vectors because they can deliver the new gene by infecting the cell. The viruses are modified so they can’t cause disease when used in people. Some types of virus, such as retroviruses, integrate their genetic material (including the new gene) into a chromosome in the human cell. Other viruses, such as adenoviruses, introduce their DNA into the nucleus of the cell, but the DNA is not integrated into a chromosome. The vector can be injected or given intravenously (by IV) directly into a specific tissue in the body, where it is taken up by individual cells. Alternately, a sample of the patient’s cells can be removed and exposed to the vector in a laboratory setting. The cells containing the vector are then returned to the patient. If the treatment is successful, the new gene delivered by the vector will make a functioning protein. Researchers must overcome many technical challenges before gene therapy will be a practical approach to treating disease. For example, scientists must find better ways to deliver genes and target them to particular cells. They must also ensure that new genes are precisely controlled by the body. 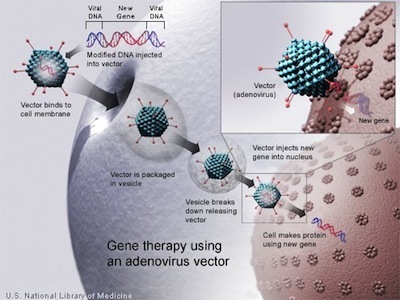 A new gene is injected into an adenovirus vector, which is used to introduce the modified DNA into a human cell. If the treatment is successful, the new gene will make a functional protein.